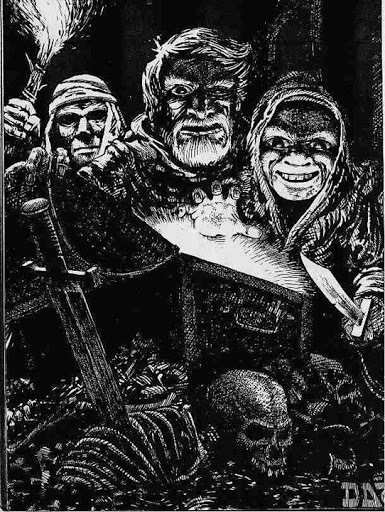 Last Wednesday (10.17.2012), we had out 10th session in my friend Jon C.’s ‘Dungeon Crawl Classics’ campaign*. Although I am not a rules meister, I really like this game. We are having fun with it despite players having some different play styles at the table. The DM, Jon C. is running this as a fairly ‘let us play this straight up to figure out this game‘ type of a campaign. He introduced us to the game using ‘the funnel’ (a word about the funnel in a moment) and, since then, we have been agents of ‘The Adventurer’s Guild.’ Not a lot of time is spent on the how and why of the guild or why we would want to be members — they just organize adventurers and send us out on missions which consist of, “Please go to location X and do this and try not to get killed…” When someone’s character gets killed, the replacement shows up as soon as possible, with a “Hello, I am X and the guild sent me…” Some of the more method-actor roleplaying people might find this unsatisfying — but I like it simply because most of my fellow players have families with young children or jobs which entail all kinds of schedule conflicts… if there was some deeply interwoven plot between all of the characters like an episode of “Dallas,” then having major characters simply be missing one week and back the next would be jarring (plus, and I’m confessing my bias here, I don’t find the ‘what’s my motivation?’ type role playing games enjoyable — no judgement, just not my thing). I actually like the campaign that is just a series of short term missions rather than proceeding along some massive story arc. Perhaps because we spend about 1/2 of the time bullshitting, joking around, etc., I think it would be hard to keep up the momentum and enthusiasm for a “long game” story. We seem to finish the published adventures that Jon C. is running every 3-4 sessions, which is neither too long nor too short. Then Jon just fastforwards through the downtime (“OK, you rest up a couple weeks, then you get a request from the guild to go to X…”) and we launch into the next adventure. The Funnel: As an option, you can start off the DCC game using 0 level characters and ‘The Funnel.’ When you play ‘The Funnel,’ each player gets 3 or 4 randomly generated ordinary medieval people (blacksmith’s apprentice, grave digger, turnip farmer, etc) armed only with a few randomly determined possessions (pitchfork, hammer, rolling pin, apron, etc). You toss these unfortunates into the meatgrinder of their first adventure and the few who don’t become sausage graduate to 1st level. Some people apparently find it irritating and stupid; I thought it was a hoot. Tables: There are lots of random tables in this game. Every time you cast a spell, you roll on a random table and modify your roll with various things (like you level, your inteligence, etc.). If you roll badly, the spell might just misfire OR it might cause magical ‘corruption’ (which are usually bad side effects). If you roll well, the spell might work better than expected. This adds a little bit of time to the game, but spells are less formulaic. As an example, in the last game both my character and Kevin’s character cast the exact same spell (color spray) with radically different results. My elf barely got the spell off and the target made his save so it had no effect. Kevin’s wizard rolled really well and his version of color spray blinded, paralyzed and knocked out all of the enemies in it’s path. There are also tables for combat (fumbles and critical hits). Fumbles mean you can fall down, trip, drop your weapon, etc. Critical hits mean you can blind, decapitate, knock over, etc., your opponent. Although critical hits and fumbles were never ‘official’ rules in old school D&D (Gygax hated them), I remember that we always used them because it was just cool to sometimes have that low level fighter decapitate an ogre with a single sword stroke. Of course, players were usually less enthusiastic when the ogre scored a critical and pounded their player character into jelly with one stroke, but I’ve always believed that if players get an advantage, monsters and NPCs should be allowed to use that same advantage. Funny Dice: In addition to the ‘funny dice we already use (d20, d12, d10, d8, d6 and d4, most of which seemed pretty strange when we started playing back in the day), DCC also uses d16, d24, d5, etc. These ‘new dice’ seem to make some gamers on the forums really mad (but what doesn’t make someone on a forum somewhere really mad?). I bought a set of ‘Zocchi’ dice needed for the DCC game through the mail for less than $10.00 including shipping. Unfortunately, the numbers on them are not painted and they are nearly impossible to read in the dim light of my friend’s basement, so I usually just roll other dice and adjust (i.e. : for a d24, I roll a d12 and a d6; if the d6 comes up odd I add 0 to the d12 and if it comes up even I add 12 to the d12 for a range of 1-24). Sometimes, if you gain an advantage or disadvantage, you can go up or down the dice chain (i.e. : if you normally roll 1d20, under some advantageous circumstances you may roll 1d24). Since the ‘criticals’ occur when you roll maximum on the dice, using a d24 may actually be disadvantageous since rolling a 20 on a d20 is a 1 in 20 chance, whereas rolling a 24 on a d24 is a 1 in 24 chance. The statistician in our group doesn’t like the funky dice; I have to confess that I seem to roll critical hits so rarely, I don’t really care (I have a d20 that seems to usually roll a 4 or less). Luck: This is one of the parts of the game I don’t find myself that enthusiastic about. Every character has a ‘luck’ score and a ‘lucky attribute.’ If your luck score is good, you get a bonus to your lucky attribute; if your luck score is bad you take a penalty. You can ‘burn’ points of luck to affect dice rolls… so if I have a luck of 10 and I rolled a 12 on the dice, I can take 2 points from my luck (reducing it to 8) and add it to my roll for a total of 14. Some characters (like hobbits) can give luck away (so if you needed to roll a certain number to make your save and a friendly halfling is nearby, he can ‘give’ you luck points if the player wants to). Thieves and hobbits regenerate their luck every session; everyone else only gains it very slowly (if at all -I’m not clear on that). The reason I don’t like luck that much is that it seems simply transactional. You roll a dice, you don’t like the result and then you just say, “Give me 5 points, Mister Hobbit.” Somehow, it feels like cheating to me. Maybe it would be better if the player had to add his luck bonus before he rolled the dice. Spellburn and Spellduels: Spellcasters can temporarily sacrifice attribute points (like strength or fortitude) to improve their spellcasting rolls. This can increase the power of your spell when you cast it, but potentially leaves you weaker afterwards. It’s a nice touch because it allows you to increase the chance of having your opponent harmed by an attack spell but it’s not free — reducing your stamina will make you weaker, for example. Spellduels haven’t come up much (yet). When two spellcasters on opposite sides are casting spells, they have the option of entering a spellduel where they seek to overpower the other spellcaster. We only did it once and I didn’t understand how it worked; if we did it correctly, one of the spellcasters in our party managed to force an enemy spellcaster to use up more magical resources than he wanted to. *Full disclosure: I have done (and continue to do) artwork for Goodman Games, including the DCC line. I get paid a one time fee for each drawing I produce, so whether Goodman sells 1 or 100,000 of a given publication, I get the same pay, so I am not incentivized by money to see that Goodman sells more product.